As of today, I've completed the December Blogging Meme. This master post has links to all of the individual answer posts I did throughout December; if you have not seen your answer, it will either be linked there so that you can read it or struck out because I simply didn't get to it. My apologies for not being able to answer all of the topics that came in, but several aspects of my holiday season were unfortunately far more rushed and exhausting than I'd planned. I watched all three parts of Back to the Future this evening in one sitting, as I'm wont to do at least once a year. Now that it's actually 2015, those futuristic fashions are extra hilarious. We may safely assume that 2015 looks the way it does in the film because Marty altered the past, perhaps, the first time he went back? I maintain that this trilogy is still one of the finest examples of tight screenwriting I've ever encountered. I had a pair of teacups bought at Porta Dextra Gallery in York, UK that had been with me since I acquired them in late 2006. They'd each been dropped many times each over the years and had completely resisted shattering; being white-glazed, they'd built up a gorgeous tea-patina on the inside. Two days ago, James dropped one of them, and it shattered. I've tracked down the potter who made them, only to discover that they're now retired from making new pieces. I don't know what to do with this teacup; feels wrong to use it as a lone piece. I don't know what to do with any of these fragments in my disbelieving hands. Oh, wow. Yes please. I'll read that with very great interest! Sorry on the tea cup. Maybe one will turn up on ebay one day if you keep checking. But matching sets are overrated. It's nice to have a collection of different cups. I've never seen BttF. I will have to. I second lavendertook; I rarely worry about matching tea cups. My first thought what I'd do, if I did worry about matching cups, is use the whole one and the broken one in an artwork, maybe as simple as placing them side by side. 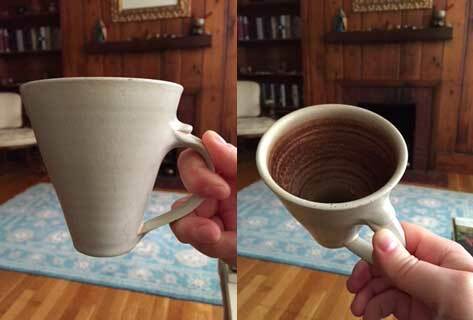 My second notion was to see if another potter might make you a matching cup. But you or the potter(s) may feel this is an infringement on the original potter's style; or not even reproducible accurately enough. Most of my cups are mismatched :) This set was special. It is one of only two sets in my possession with any kind of matching theme going on; they were just so...strange, so simple, so graceful. They were our wedding teacups. James mocked me for buying them, and then within three weeks they were his favorite teacups in the world. Seven years we used them. He's the one who shattered the cup, so that made it a bit more devastating. I have spent the past few days badgering people for leads on the potter, and just now, it's paid off. He's retired, but he has some cups left. He is going to let me know how many and quote a price. It is a wonderful series, and I agree about the screenwriting. My sympathies on losing a favourite teacup. It is devastating. The screenwriting is just so tight, ugh. And it accomplishes so much in relatively little screen time, even across three films. Truly admirable. Alas, the trash-bag with the fragments is long gone. Poem, though, maybe. If it's a particularly treasured teacup and you still have all the major pieces, maybe you might be able to track down someone who does Kintsugi? Oh wow. How have I never heard of that before? It's surprisingly obscure for something so full of symbolism! There's something sort of soul-deep awful about breaking something that has come so far with you. I'm really sorry. Fingers crossed that tracking down the potter yields good fruit. The potter is checking their stock for ones similar. It's a start!